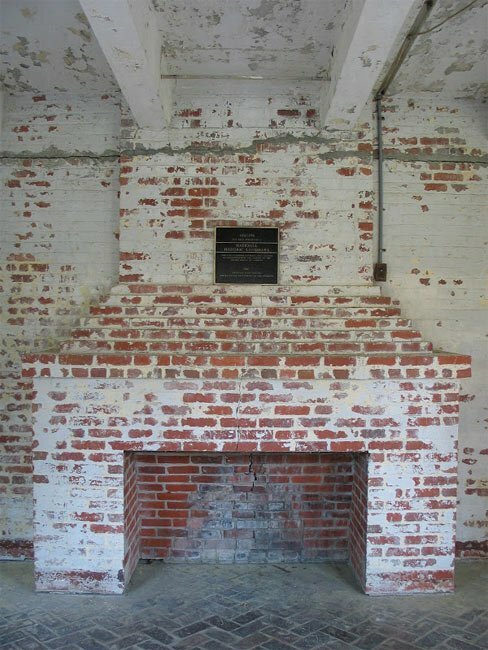 The heart of Huntington Beach State Park is Anna and Archer’s Huntington’s former winter home, studios, and stables – Atalaya. The name is Spanish for watchtower, the dominant architectural feature of the castle-like structure that Archer designed based on memories of his travels to the Mediterranean Coast. The watchtower may not have served as a lookout, but it did have an important function: it served as a water tower instead. Nevertheless, the result is spectacular. No furniture remains inside, and open windows have left the walls and floors exposed to the elements. Wandering down the cool corridors provides a welcome respite from the sun and sand. It also makes a magical maze for children to explore. 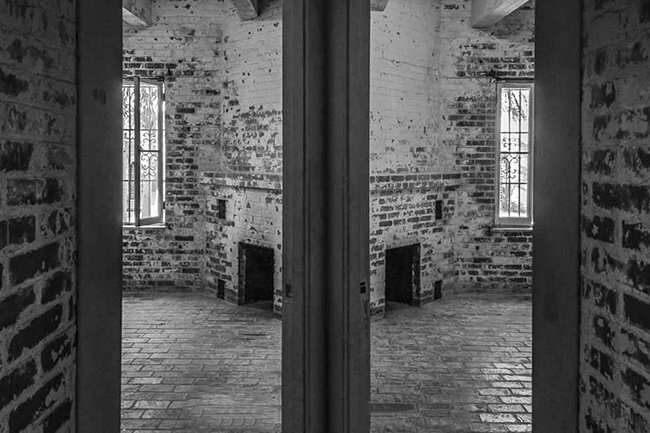 The above photo shows one of Atalaya’s corner rooms. 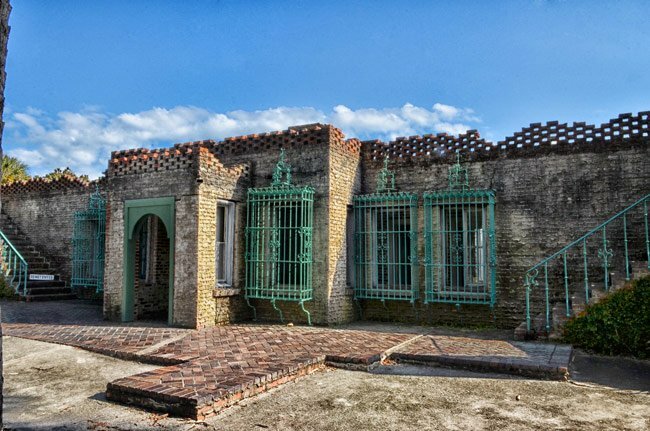 Atalaya’s four wings form a square around a large interior courtyard. 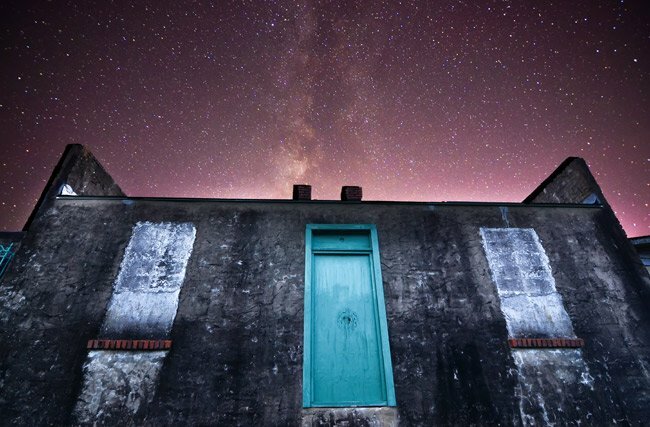 The outer walls of the home extend 200 feet, and there are 50 rooms in all – including studios and stables. The massive structure is often mistaken for a jail or fortress. 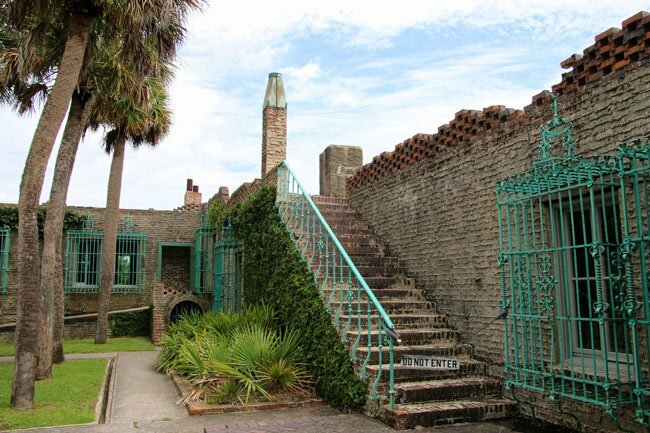 Today, people commonly refer to Atalaya as a castle. During the Huntington’s winter visits, they often kept large animals such as bears inside their home. Anna, a master sculptress, would use these animals as models for statues. 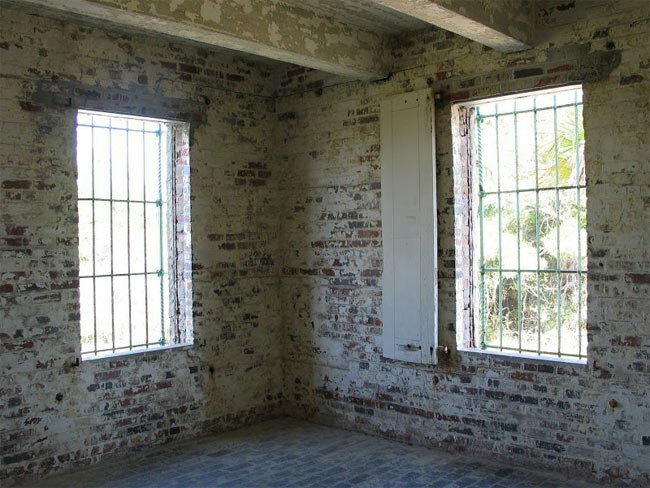 There were also servant quarters, a library, a sun room, and various food preparation and dining rooms – including a specialized oyster-shucking room! 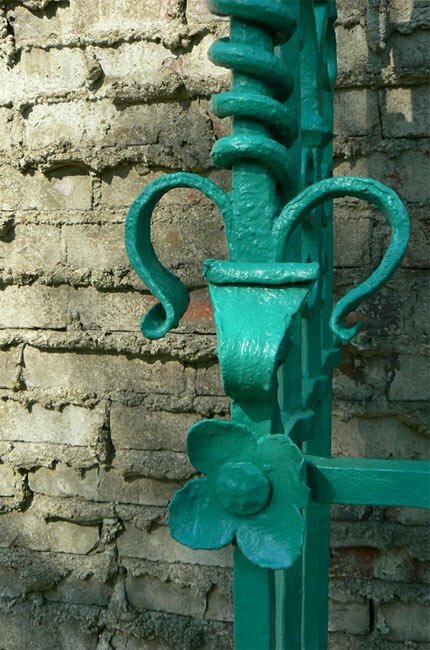 Geraniums and liropie grow in one of Atalaya’s beautiful flower boxes, shown above. The flower boxes line a central corridor which serves as the home’s main entry and divides the interior courtyard in two. 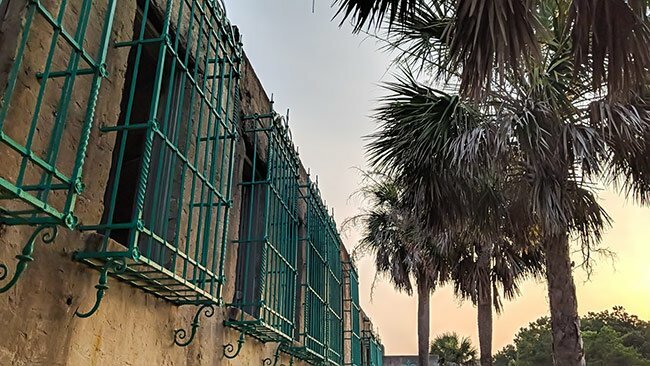 The courtyard is planted with palmettos, South Carolina’s State Tree. 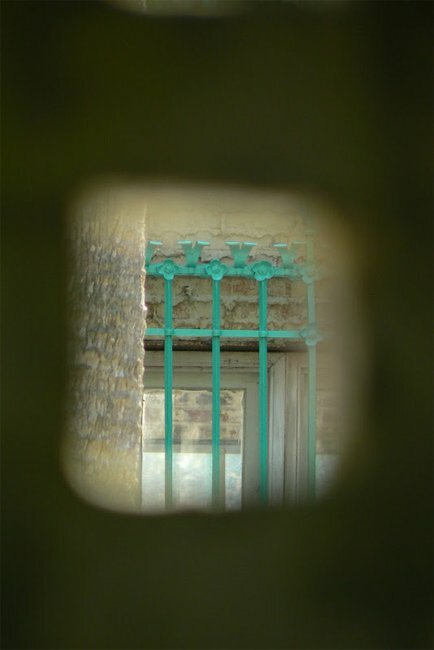 For her part, Anna Huntington designed Atalaya’s iron window grilles. 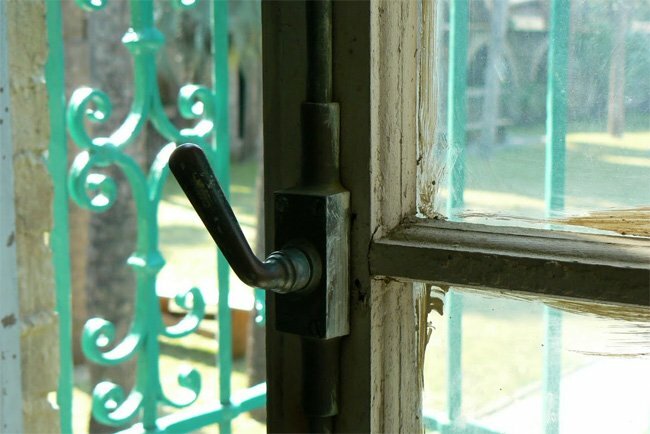 Many of the window panes and casements are now missing, but here and there they remain. Wind rustles through the empty spaces as you explore, lending life and movement to the low, cool rooms. Many of these photos were taken during SCIWAY’s day at Huntington Beach in March 2008. 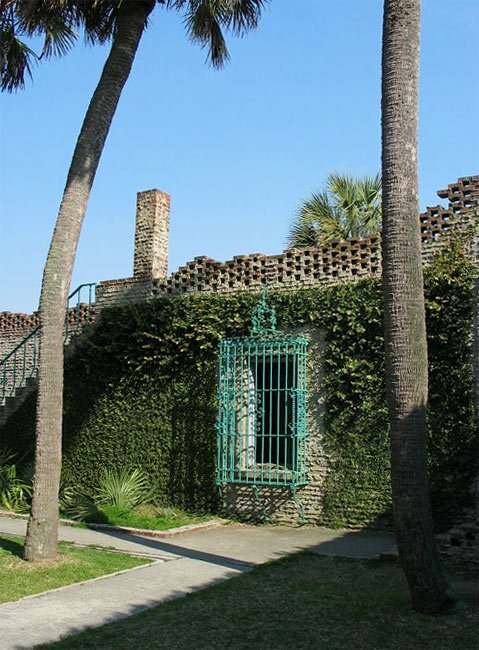 Huntington shares its history with Brookgreen Gardens, located just across US 17. The two properties make up more than 9,000 acres of property once owned by Anna and Archer Huntington. The Huntingtons came to Georgetown in 1930. 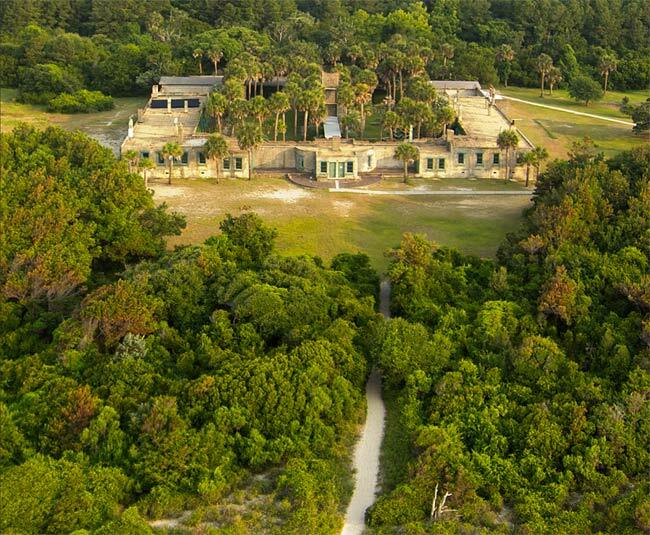 They built their winter home, Atalaya, in 1931 on what was then known as Magnolia Beach. The rambling fortress is separated from the ocean only by dunes and low thickets of vegetation. In the Huntington’s time, it was even nearer to the sea. 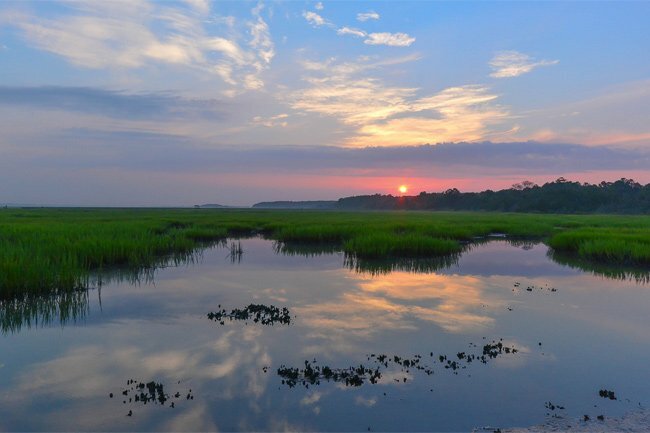 Now a state park, the land today provides protection for nature and wildlife. Brookgreen features a small zoo showcasing native animals, and there are plenty of trails and hiking opportunities at Huntington. 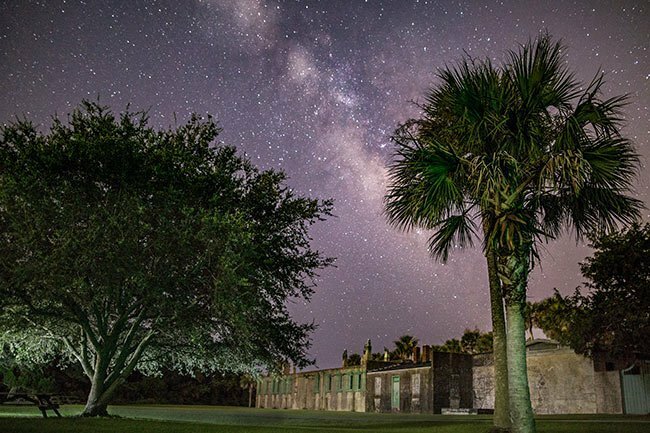 Its three miles of undeveloped oceanfront – a rarity in South Carolina – are alone worth the trip. 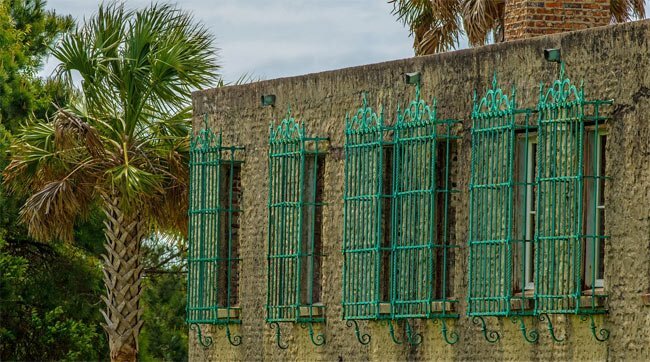 (Atalaya Castle) Atalaya is significant for its unusual architectural style seldom found in this country, and as winter home of world famous sculptor, Anna Hyatt Huntington, and her philanthropist husband, Archer Milton Huntington, the designer of Atalaya. It is located approximately one hundred and fifty yards from the Atlantic Ocean within the boundaries of Huntington Beach State Park. 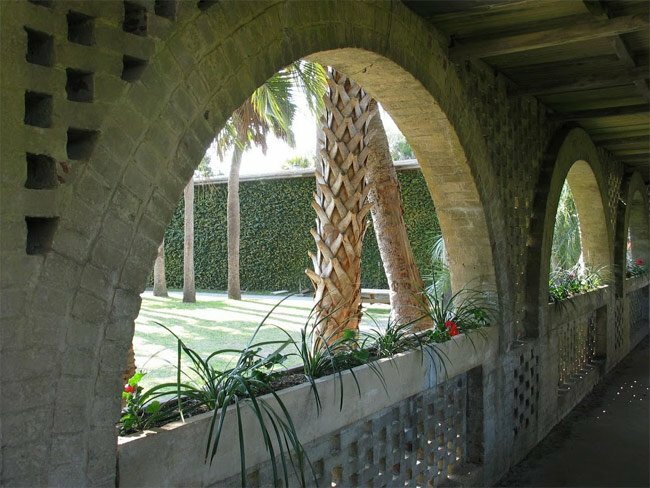 The single story masonry structure was conceived by Mr. Huntington and was meant by him to resemble the Moorish architecture of the Spanish coast. 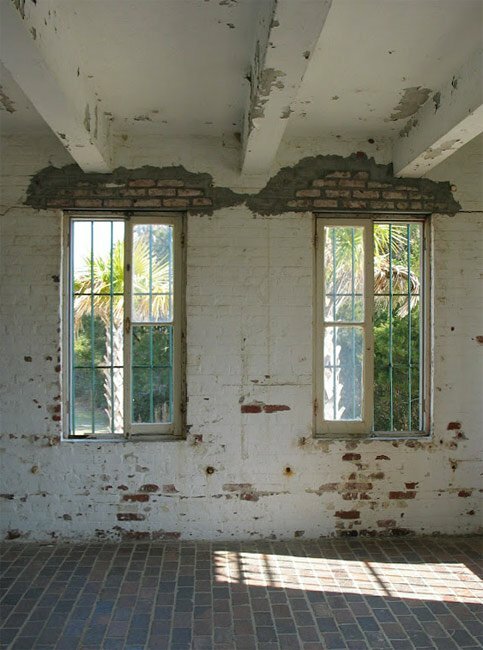 Atalaya was built between 1931 and 1933 by local laborers under the direction of contractor William Thompson. Atalaya is built in the shape of a square. It has a flat asphalt and gravel roof with a parapet of simple decorative brickwork. There are twenty-five chimneys located throughout the house capped with copper hoods which rotate with the winds. The exterior walls are stuccoed, with the inner courtyard walls have untooled mortar joints. All exterior walls are sprayed with a gray cement coating to help the building blend in with the environment. The house contains thirty rooms which are connected by an inner hall that runs the length of the northern, southern, and eastern elevations and contained the living quarters of the Huntington’s and their servants. Little alteration has taken place on the home and it looks much as it did when completed. Did you enjoy this page? Do you have any information we should add? Send us your comments below — we can't wait to hear from you! returned via Mac. Loved your website. 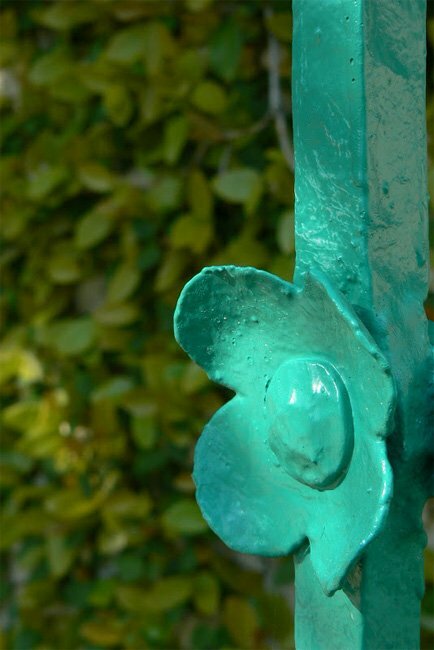 I was employed for a short time at Brookgreen Gardens and read many available books about its history and sculpture. One thing I remember reading that I have to paraphrase: Atalaya was magic. You could see the glow of a fire at Atalaya from the main house at Brookgreen. Correction: The Huntingtons came to Georgetown County in January 1930 when they toured the property and secured the purchase that month. This was really an incredible surprise. Came to camp at Hunting Beach at the suggestion of friends, and didn’t know anything about this historical gem. Atalaya is one of those places I soon won’t forget. I can only hope to attain mere portions of the wonderful good deeds these two people have contributed to our world. Their energy will help continue my forward motion on my journey exploring every day people doing extraordinary things. Although this couple was financially abundant they valued all life had to offer and lived incredible lives. Extraordinary! Awesome, beautiful place. I love it!